I almost titled this post "Birthday Suit" but I didn't want any perves to be disappointed by my blog after arriving here from an internet search. So. I'm the birthday girl today. Yep, I've arrived at the ripe old age of 26. I'm sure there will be a birthday post coming the future chronicling the celebrations (I've already had some pretty great stuff happen) but for now you get the outfit of the week. Even though this is not what I'm actually wearing today, I did wear this last weekend to a pre-birthday dinner at The Melting Pot with the in-laws, so I think it's suitable for this post. Did you notice anything weird in those pictures? Yeah, I cut my finger. With a coffee mug (?). And somehow it required a doctor's visit,antibiotics and a tetanus shot. Happy Birthday to me. Happy Birthday but sorry about your finger. That's no fun! On the other hand, that skirt looks divine on you! Hope you have a wonderful day! Happy birthday! 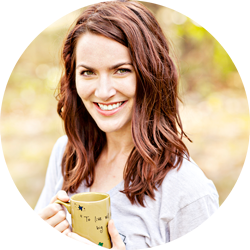 I love your blog so much and I love following your outfits and your home-remodels! Hope your day today is full of so much love and that you feel very celebrated today! Thanks so much, Tera! I'm always so excited to hear that anyone reads my blog :) P.S. I love the envelopes you've been working on! Happy Birthday girl! Love the contrast created by your coral necklace on the purple canvas! Love the skirt too! Too bad that you have an injured finger, hope it heals up soon! Happy Birthday! Your skirt is awesome. I hope your finger heals quickly! Darn those floppy arms you have. I blame them for the coffee mug injury. I do have one question for you. Was Eric surprised that you were able to cut yourself with the coffee mug? Hahaha, they are definitely to blame. Neither Eric nor Hanna were surprised at all, unfortunately. It was definitely one of those, "Of course you did" situations. Stopping by from WIWW. Happy Birthday! Cute outfit! Ewe, yucky cut! You could be like on that Seinfeld episode where George thinks he got flipped off, but it was just a guy who had a cast on his middle finger and had to hold up his hand to signal what direction he was turning...haha...random. I love that skirt and the colorful way you paired things up! So cute! LUV your outfit!! Happy Birthday. Happy birthday! LOVE the maxi skirt! Oh well...I'll have to find another one. Your's is great and Happy Birthday! !